Have you been puttering around your kitchen this Fall? And by puttering, I mean just rearranging things. It’s my favorite thing to do. It’s how I keep my kitchen clean. I pick stuff up all the time, dust, and try a new arrangement. The thing I love the most about my open shelves is that I can have fun changing things around every season. The shelves are always evolving, although most of the time I start with the same basic elements and add or edit out a few items. Sometimes I’m in a color mood and sometimes not! Last time I showed you my kitchen display shelves, it was the end of the summer and I had added in more yellows. Now it’s Fall and I simplified the color scheme a bit last weekend, just because. No real reason, I have just been in that “simplifying” mood all around my house. I don’t even necessarily add any themed elements or even colors that look like “Fall.” I’m a rebel like that. I just go with my whims and stick with mostly dishes and a few tried and true accessories. I don’t have to change things a lot, small changes make me just as happy! Rearranging open shelves is like a fun game. For moms. It’s what I do on a Fall Friday night. I am already dreaming up a new idea I want to try for these shelves — maybe next month! Do you have open shelves? The small giraffe on the shelves was sent to me as a gift from the Lulu & Georgia gift shop (such cute gifts!!). It is perfect for holding rings, but I just thought he was so cute I wanted to see him up on my shelf for now! Also, I was featured on their blog showing off a few of my favorite things from Lulu & Georgia! Many of the other items came from TJ Maxx, Target and vintage stores. I love collecting fun shapes and colors of dishes! Love the open shelves and I do have one in my kitchen. You have inspired me to change it up! Love your open shelving! Always seems like such a cool, fun space to play around with. I’d love to have one..I have a great room and the kitchen part is really small. I have 2 upper cabinets..one on each side of the stove and microwave with a narrow one above microwave. I need every inch of space to store everything and there are too things that just aren’t display worthy! :) And no wall space to build a shelf. I love having an open floor plan but there certainly are pros and cons. Anyway, I love yours! I LOVE my open shelves and in fact don’t have any doors on my upper cabinets. I thought it would require so much maintenance but I’ve found all I have to do to conceal any less than pretty stuff is to have a good front row. So my coffee cups shelf has four white cups with nice curled handles in front and my tangle of assorted cups behind. For shelves that had to contain assorted grocery items I have two deep baskets that keep the contents tamed and hidden. I forgive myself my assortment of wine glasses because the other shelves around them are so neat. Everytime I look at my open shelves they make me feel light and happy!! and my old kitchen now looks updated. I simply love white dishes and you’ve displayed them beautifully! I’m looking to purchase a Kitchenaid mixer, but I can’t decide on a color! I’m torn between white or a soft pink or blue. I love your white one :) gives me some inspiration!! I am in love with your shelves and the white dishes. I have my house plans drawn and begin building in 2014. I keep deleting upper cabinets in order to have a very open kitchen and lots of windows. I will have a few open floating shelves for my new and growing collection of white (my weekly purchase at TJMaxx). I’m nervous about loosing my uppers but seeing your kitchen gives me confidence to go for it. How fun to rearrange when the mood strikes? Thanks for your inspiration. 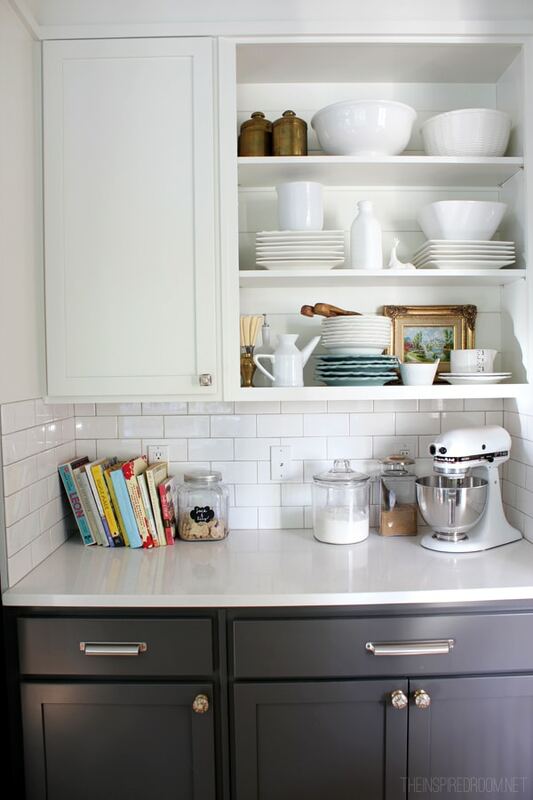 I have open shelves and love them…because I love change…and the men in my home can always find what they need. Happy Day! I don’t have open shelves. When I lived in Hawaii, open shelves were pretty common and that was to actually keep the roaches out. Gross, right? Roaches liked dark closed spaces. So open cupboards were necessary. We built our home in 2008 and so many people tried to talk me out of open shelves saying they collect dust and look messy. I was not dissuaded and would highly recommend this idea to anyone who has an opportunity to create the kitchen they really want to have. Just a couple of weeks ago I pulled everything out of every cupboard and off every shelf and did a complete re-arrange which I posted on my Instagram. I love change and especially seasonally change. This was an utterly satisfying endeavor. LOVE these open shelves and the way you’ve styled them. Also, we’re building a home presently and my backsplash, grout, counters and cabinets are so similar to yours! So neat to see a kitchen so close to what we’ve designed! Gets me excited about how ours will come together. Gorgeous! Such a beautiful spot. I’d love some open shelves in our kitchen to putter around with. Maybe someday? Would you mind telling where you found your glass kitchen canisters? I’ve been looking everywhere! I do not have open shelves in my kitchen. In my house with so much dust I would have to clean them every day! However, I really do like the look of them and the idea of them. I also re-arrange my kitchen coutners, I move the coffee pot and the stand mixer and other things all around, like you, for no specific reason other than to make the kitchen look different! I love the pitchers -where did you get them? I love the open shelf look. I would have to be a lot more organized and clean so do it though. Great post and creative ideas. Am thinking of open shelves in a awkward living room corner where nothing else looks quite right, it will be fun to change the space up and have a new look at your treasurers on a regular basis. The kitchen is my favourite room in the house. I love your open shelves. I have a dresser I arrange my blue and white plates on and then hide all the bits and pieces that aren’t so pretty in the cupboard underneath! 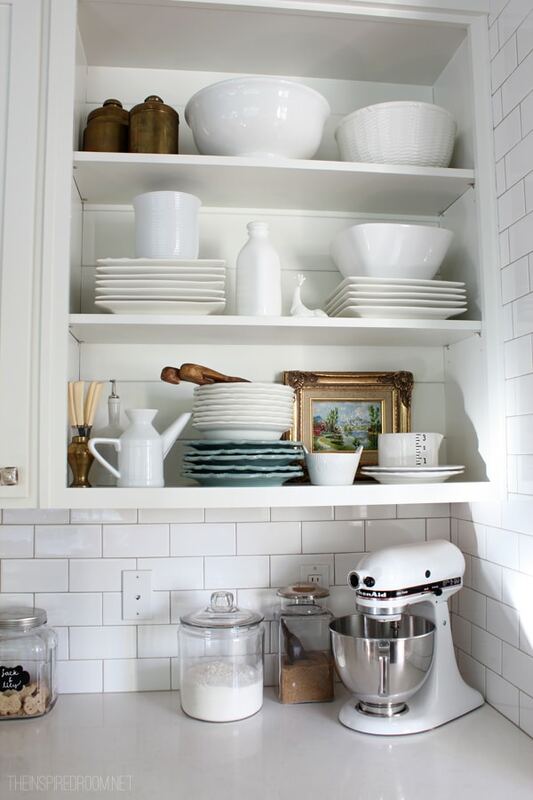 Love open shelving in the kitchen. Also a big fan of the clean look of white on white. Thank you for sharing this one. I often tell people when they redesigning their kitchens – think about open shelving as a creative solution. Saves money on upper cabinet purchases and you can display things you like. Thanks again. Have a great, creative weekend ahead! I love your grout color. I’ve been looking for one exactly your shade of grey. Do you happen to know what yours is? Thank you! I love your Fall shelves and your entire kitchen and your wit and whimsy and pretty much just general YOU.